202 pages | 6 B/W Illus. This book explores social movements and political activism in contemporary Japan, arguing that the 2011 Fukushima nuclear accident marks a decisive moment, which has led to an unprecedented resurgence in social and protest movements and inaugurated a new era of civic engagement. 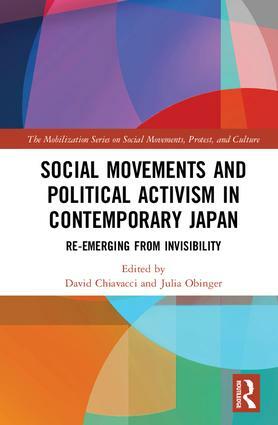 Offering fresh perspectives on both older and more current forms of activism in Japan, together with studies of specific movements that developed after Fukushima, this volume tackles questions of emerging and persistent structural challenges that activists face in contemporary Japan. With attention to the question of where the new sense of contention in Japan has emerged from and how the newly developing movements have been shaped by the neo-conservative policies of the Japanese government, the authors ask how the Japanese experience adds to our understanding of how social movements work, and whether it might challenge prevailing theoretical frameworks. Part II: Fukushima and Beyond – Towards New Political Culture and Action Repertoires? David Chiavacci is Mercator Professor in Social Science of Japan at the University of Zurich, Switzerland. His research interest is the economic and political sociology of contemporary Japan. Julia Obinger is a Visiting Scholar at the University of Oxford, Skoll Centre of Social Entrepreneurship. Her research interests are ethical and sustainable consumption and new forms of political engagement in Japan. Published in conjunction with Mobilization: An International Quarterly, the premier research journal in the field, this series publishes a broad range of research in social movements, protest and contentious politics. This is a growing field of social science research that spans sociology and political science as well as anthropology, geography, communications and social psychology. Enjoying a broad remit, the series welcomes books on the following topics: social movement networks; social movements in the global South; social movements, protest, and culture; personalist politics, such as living environmentalism, guerrilla gardens, anticonsumerist communities, and anarchist-punk collectives; and emergent repertoires of contention.